Our Method | Welcome to Peak Performance! Dr. Steele utilizes specific upper-cervical techniques. Both methods use a light touch to trigger the body’s own inherent healing capacity. Upper-cervical chiropractic has evolved from the work of chiropractic pioneers like B.J. Palmer, famous for the “Palmer Method.” He sought to revolutionize health care with a new perspective: that health comes from within, and that a lack of normal nerve function results in a lack of health that is expressed as disease. Further refinements by Doctors Grostic, Gregory and Sweat led to a greater understanding of how the alignment of the head and neck influence the brainstem for health and wellness. Upper-cervical chiropractic frees the nervous system of interference for optimal communication using the least amount of force possible. It allows the body to realign itself and do its own healing. It is considerably gentler, more effective and less invasive than other methods. 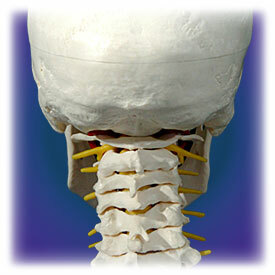 Upper-cervical chiropractic holds that the brainstem and atlas vertebra are key to the balance of the entire spine. Once the head and neck are in alignment, the entire spine will follow suit and the nerve messages between your brain and body will travel free and clear without interference. This then allows the innate intelligence and healing abilities of your body to unfold naturally. The upper-cervical adjustment is extremely gentle and precise. There is no twisting, popping, or cracking. Because of the precision of the adjustment, very little force is required. Patients often do not know that the procedure has begun, let alone been completed! How does this light touch allow the body to realign itself with a spinal adjustment? A basic explanation is that it triggers a reflex in much the same way as a light tap below the knee will cause your leg to jump. The Vestibulospinal reflex is the reflex that connects our inner ear or vestibule, the sense organ for balance, to the muscles supporting the spine. This maintains our body balance and keeps us upright on our feet against gravity. The brainstem is like a switchboard sending a continuous stream of nerve messages to their proper location including those pertaining to this reflex. The upper-cervical adjustment restores this reflex to its full capacity. As the body re-balances itself, structural realignment automatically takes place at the same time. Reflexes by nature take very little stimulus for activation and this is why the adjustment that triggers the Vestibulospinal reflex works with such a light touch. In fact, a successful adjustment can only come from a light touch.